Welcome to Part 3 of my Skin Care Routine! As you may recall from part 2, I don't use serums in the morning, but I make up for it by always using a moisturizer or bb cream. My go-to moisturizer is Philosophy Clear Days Ahead. This moisturizer is oil-free, contains salicylic acid, and mattifys my face. This is perfect to use under any foundation, especially my holy grail: BareMinerals BareSkin Brightening Serum Foundation. For heavier foundations I mix Philosophy with a Smashbox primer (like the pictured Blemish Control primer). Supergoop Daily Correct CC Cream: Offers a great amount of sun protection for summer-time wear. I love how nicely the formula blends into my skin. 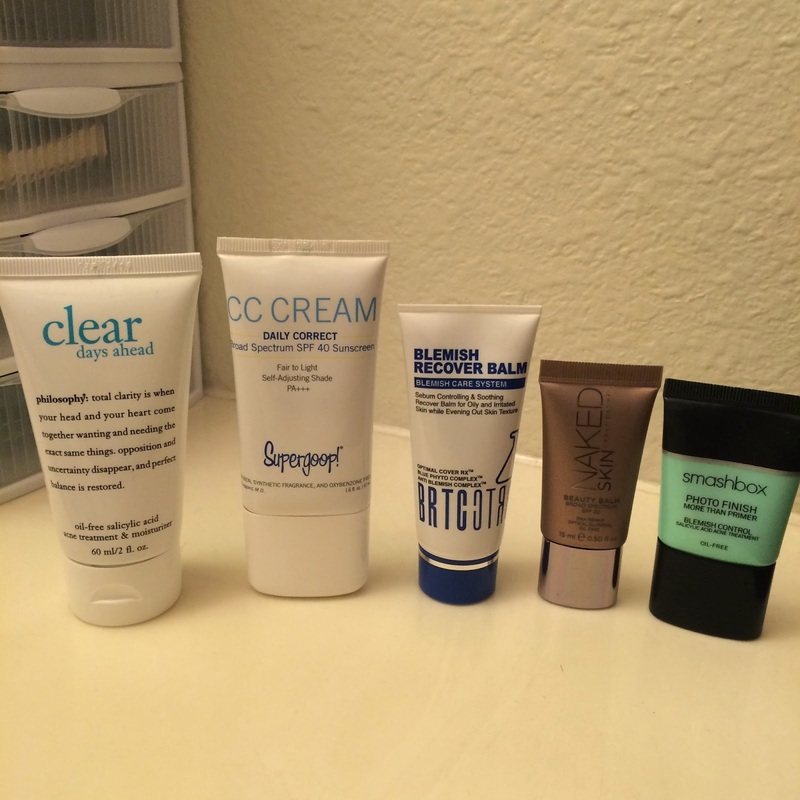 BRTC Blemish Recover Balm: I love this bb cream for face-demon days. It smells like witch hazel and tea tree oil, controls oil like nobody's business, and magically helps clear up my face while wearing it. Urban Decay Naked Skin bb cream: Offers no coverage, but uses light to blur imperfections on your face. I love this stuff for everyday, but it's my go-to on blemish-free days when I just need to tone down redness and acne scarring. From here goes the rest of my makeup, or just the rest of my day until my night-time skin care routine begins (stay tuned for part 4). "Bringing you the latest in Korean beauty trends and products." Shop with my affiliate link at no cost to you, but help keep this site up and running! Prescription help for your skin, right in your mailbox. Get your first month free when you sign up through this link.